I don't want to live in a hole anymore. I'm going to do something about it. Who you gonna believe, me or your own eyes? 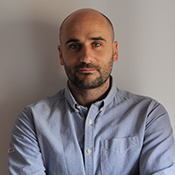 Juan Alcalde received a primary degree in geology from the University of Salamanca (2009), subsequently completing a masters degree in Geophysics (2011) and a doctorate in Earth Sciences (2014) at the University of Barcelona. He is a geophysicist with interests in reflection seismic processing and interpretation. He has worked in integration and joint interpretation of geophysical datasets, characterisation of CO2 storage sites and numerical modelling for CCS. More recently, he has conducted parallel projects researching Scotland’s potential to develop geothermal and negative emissions technologies, as well as investigating the minimisation of biases in seismic interpretation.